March 29, 2016 9:45 A.M.
Ontario is asking businesses and the public to help identify and improve regulations that are unclear, outdated, redundant or unnecessarily costly. Premier Kathleen Wynne joined Brad Duguid, Minister of Economic Development, Employment and Infrastructure, today at Novo Plastics in Markham to launch the Red Tape Challenge, inviting the public to pinpoint problems such as forms that are too complex and technical information that is hard to understand. Through this innovative online consultation tool, people across Ontario will be able to help identify and eliminate regulatory duplication, lessen compliance burdens, shorten response times and make it easier for businesses and citizens to interact with government. The Red Tape Challenge will focus on six business sectors over the next two years. It will start with auto parts manufacturing, then focus on food processing, financial services, mining, chemical manufacturing and forestry. This crowd-sourced program will help deliver on Ontario's commitment, through the Business Growth Initiative, to develop modern, outcome-focused and evidence-based regulations. The Business Growth Initiative will help foster an innovative and supportive business environment, while protecting environmental and health standards and enhancing worker safety. Reducing regulatory burden is part of the government's economic plan to build Ontario up and deliver on its number-one priority to grow the economy and create jobs. The four-part plan includes investing in talent and skills, including helping more people get and create the jobs of the future by expanding access to high-quality college and university education. The plan is making the largest investment in public infrastructure in Ontario's history and investing in a low-carbon economy driven by innovative, high-growth, export-oriented businesses. The plan is also helping working Ontarians achieve a more secure retirement. 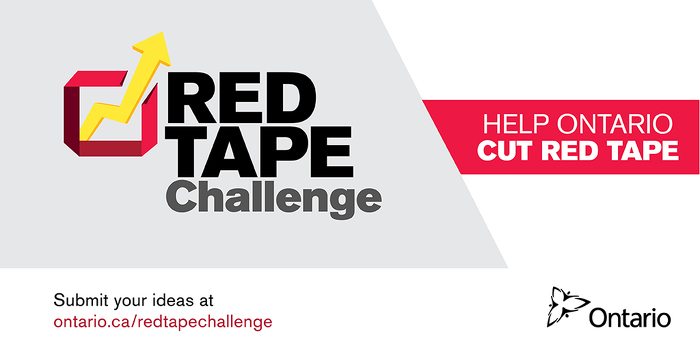 Through the Red Tape Challenge, the public, businesses and industry associations can submit comments about Ontario’s regulatory requirements directly to the government at ontario.ca/redtapechallenge. This is part of the province’s Open Government commitment to create a more transparent, accessible and collaborative government for the people of Ontario. Ontario’s 2015 Burden Reduction Report identified a total of $44 million in savings, building on $6 million identified in the 2014 report. This puts the province on track to reach its target of reducing the business burden by $100 million by the end of 2017.